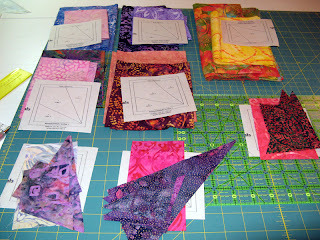 Here's my assembly for the 5th Quilt Square Block that is a Trip Around the World pattern. I've ended Wednesday night with the rows "webbed" together. Later tonight when I get home from work I'll get the rows together. Hard to believe the rows will get down to the size that fits the frame pieces. 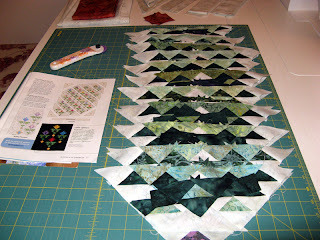 I'll be posting the finished block on Friday...right on time! Today is my niece Tiffany's Birthday. Where has all the time gone...she turns 20. Tiffany is a beautiful girl in all ways. 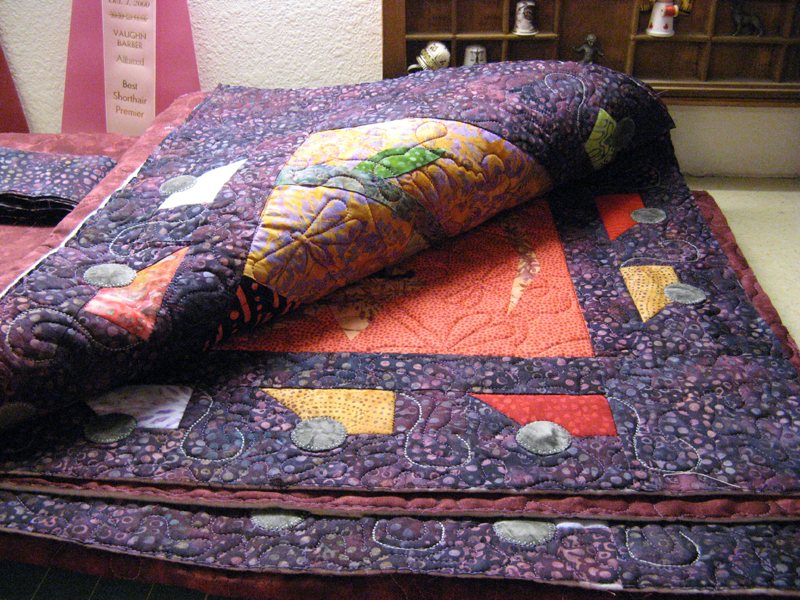 Now if I could just teach her how to quilt! We've had few opportunities together for this, but when she was just a youngster I helped her make a lap quilt that had a unicorn theme. Wonder whatever became of that one. 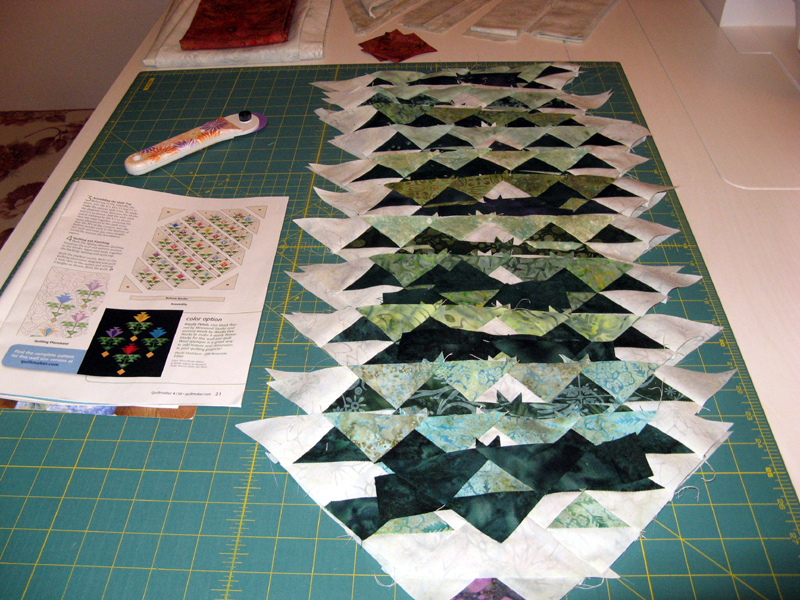 Most recently she helped me with Kordova Klosure which is right now in the quilting queue at Kerry's Quilting. 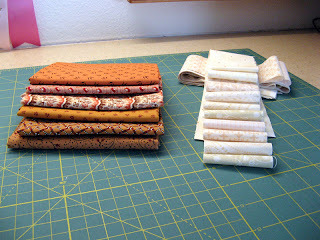 I have been busy with Klunky Korners these last couple of days putting on the binding. I found a very good match with the fabric. Remnants passed to me by Melissa, a homespun of black with gold, green and red stripes. It brings in all the colors of the corner stones. 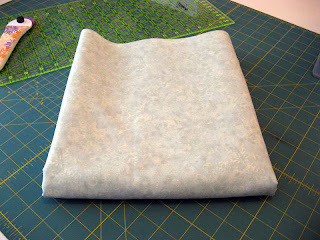 I have one side and the sleeve to stitch down. I'm thinking it will be done today :)! This of course is what I should be working on...but you know very well how this works. 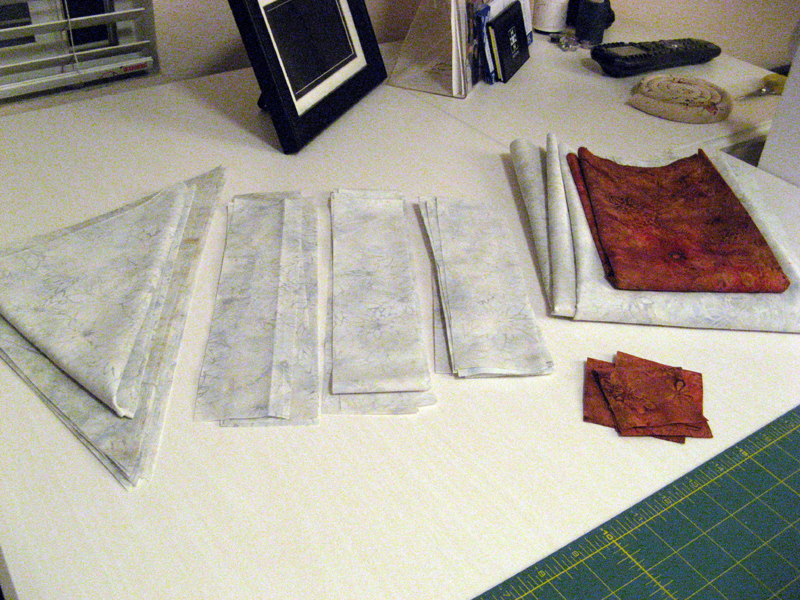 I have the fabrics all cut into the 1 1/2" pieces. Just need to sit at the sewing machine and stitch. Tonight's probably it's night...it must be done tomorrow! Memorial Day is a special day to remember those that served to protect our freedom. Of course we should remember these brave men and women always. Here's what I'll be working on today. 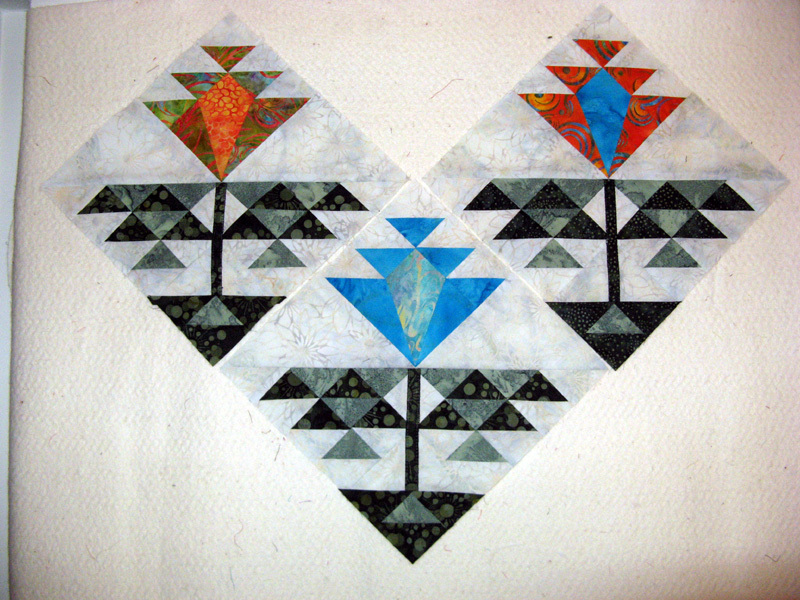 From Lori Smith's Quilt Squares #4 pattern the middle square on the right that is a Trip Around The World. 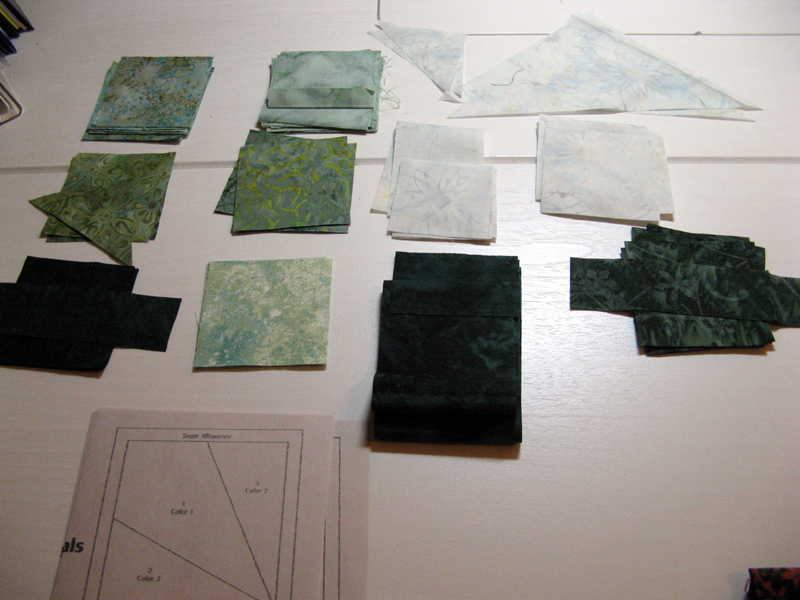 I've got these fabrics planned for the pieces. 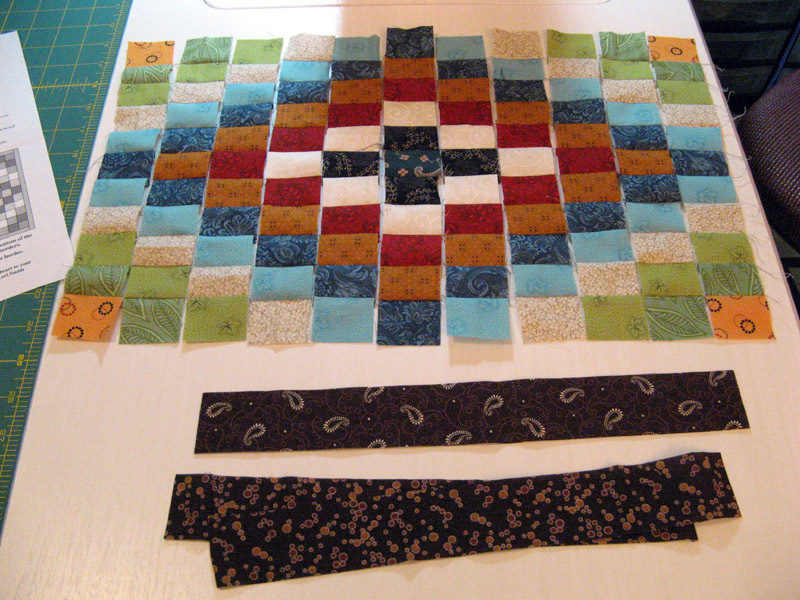 The teal at the bottom will be the center and the two browns at the top will be the borders. Anxious to get this one done...it must finish by the end of the month, but I don't see that as being a problem. 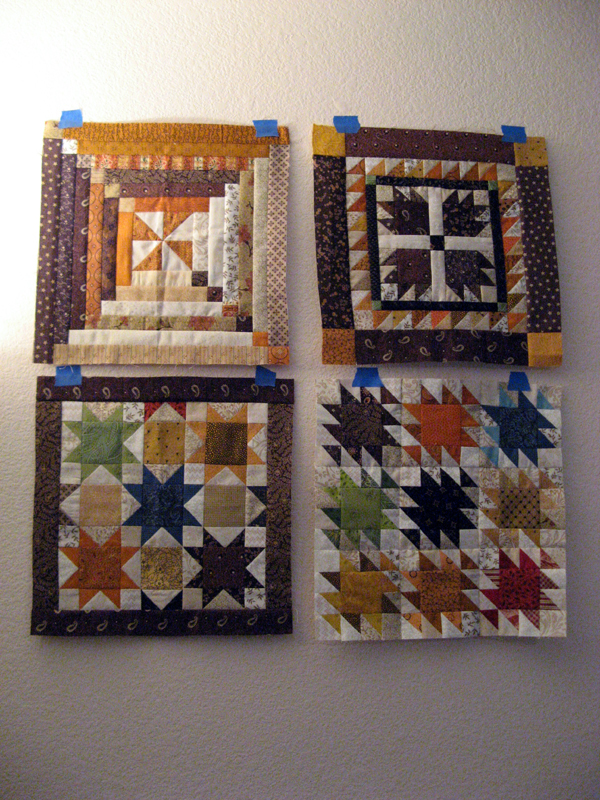 These are the four that were made with Lori Smith's Quilt Squares #1 pattern. 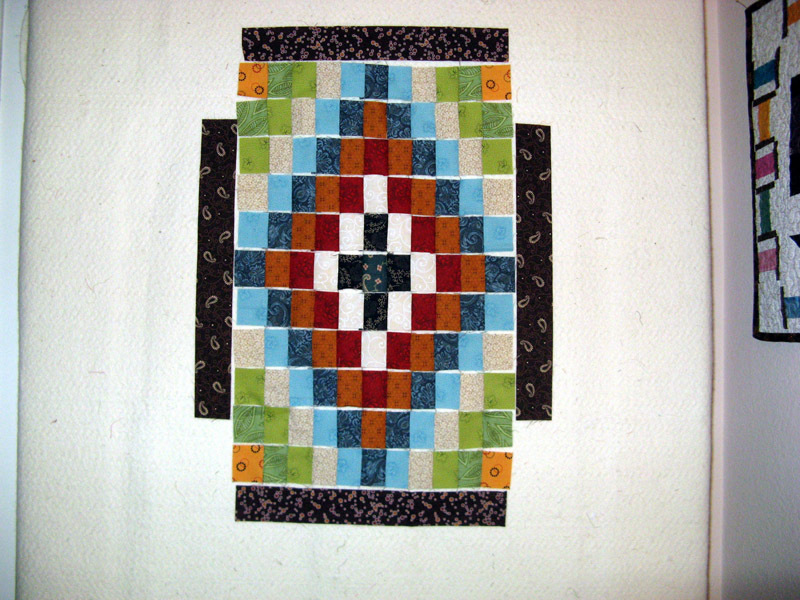 This project is part of a Quilt Along with Jo's Country Junction. The other project that I'm working on right now is Knickels. 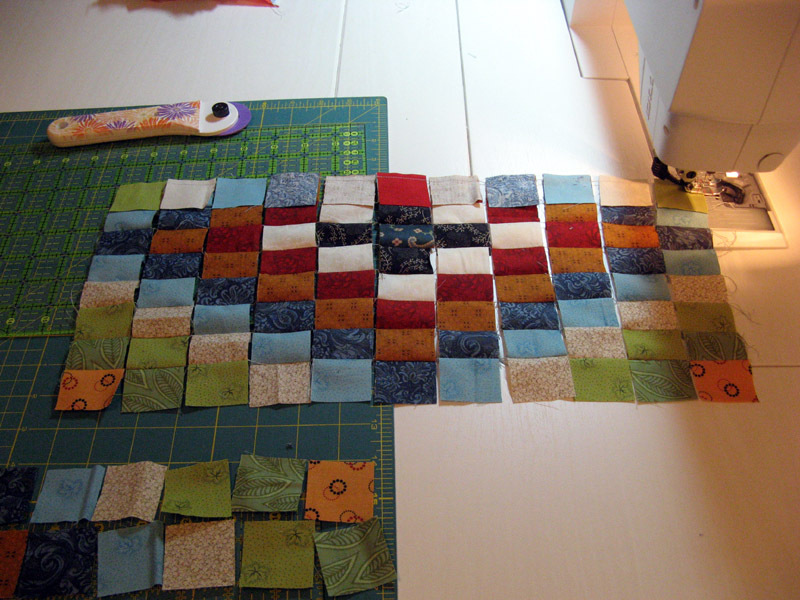 I have a little over 20 blocks still to assemble then there's the pieced border. Knickels will finish as a rectangle a bit smaller than a twin. So what's on your design wall today? 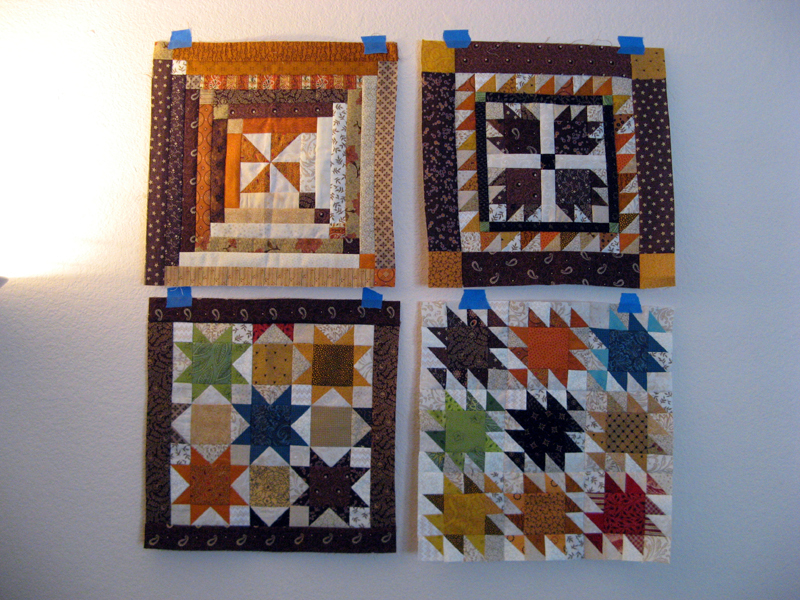 See more projects through Patchwork Times. 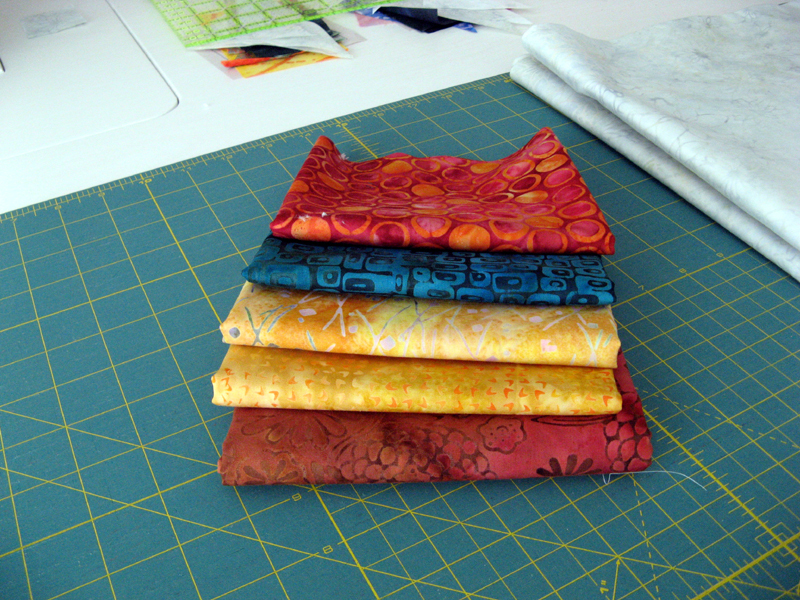 I went by Joann's to use a couple of 40% off coupons on 45mm blades and stumbled across this FQ bundle that was more than perfect for a project designed by Sharyn Craig called Building Blocks available through Cozy Quilt Shop. 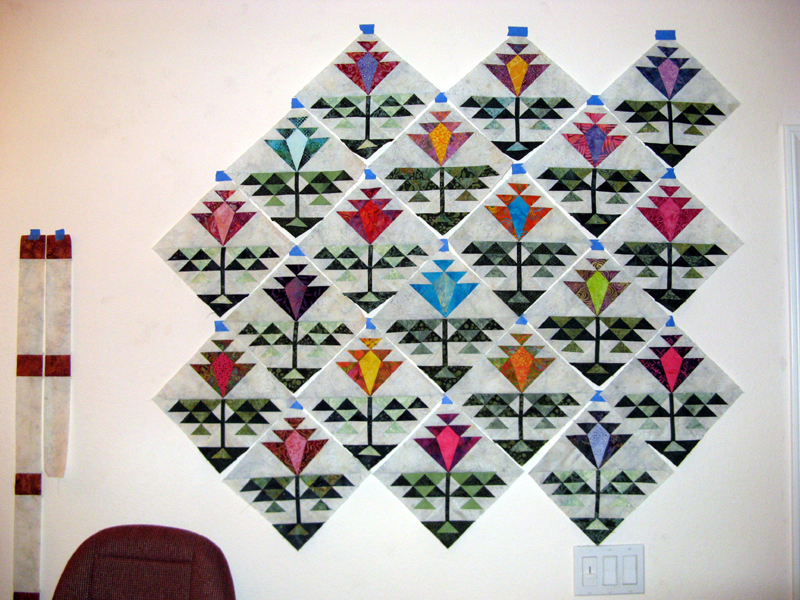 It is a 12 month pattern series that was released in 2011. My packets included black and whites each month. 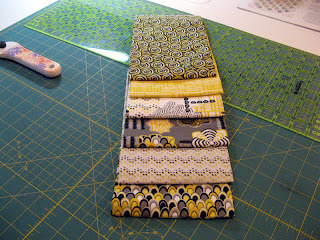 I decided to add yellow...need I say more...oh did I mention the 50% off coupon I had for a fabric purchase? My project will be called Konstituent. Look for more on this project in a few months. Kamile needed the perfect back and it wasn't in my stash... I picked this piece up at Memory Lane using up a gift card amount plus a little more. The pattern called for 5 1/2 yards but I will make this 3 3/4 yard piece work with some creative seams! Kamile is finished YIPPEE! The 3 3/4 yards in will also go out in this same report. Kamile completely done and with days to spare! I have several more projects waiting for me that the extra few days before May finishes and Patchwork Times announces June's UFO. 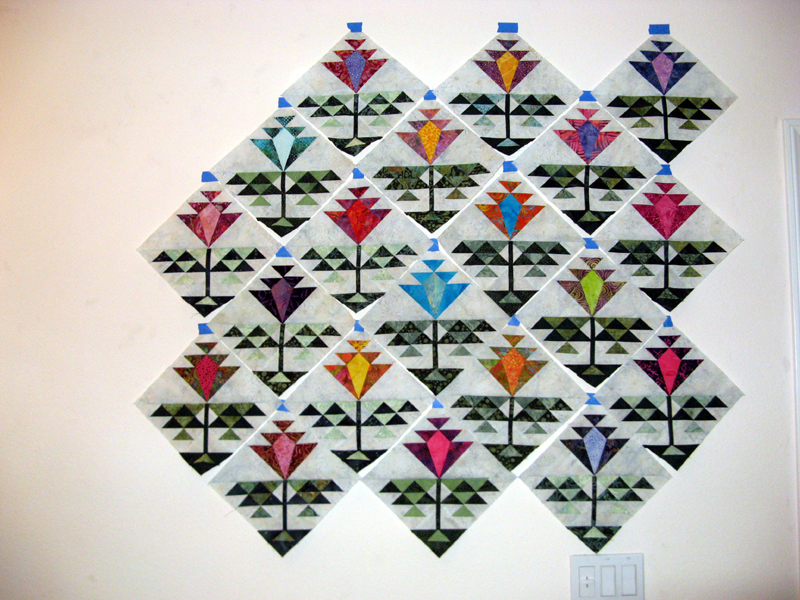 Kamile is a Quiltmaker pattern by Caroline Reardon issue March/April 2011 #138. There's Klunky Korners to add binding, sleeve, and label. Black binding is planned. Klunky Korners is a Bonnie Hunter pattern called Chunky Churndashes FREE on her website. There's also Knickels that I've been spending time with on Friday and Saturday. 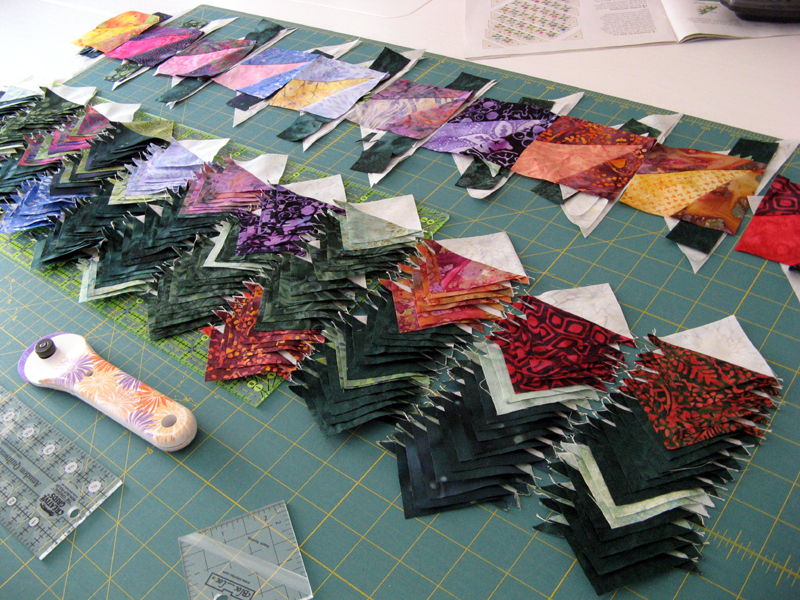 I'll be making a total of 80 blocks; 56 so far and 24 more to go. There's a solid inner border and a pieced second border followed by a solid outer border. 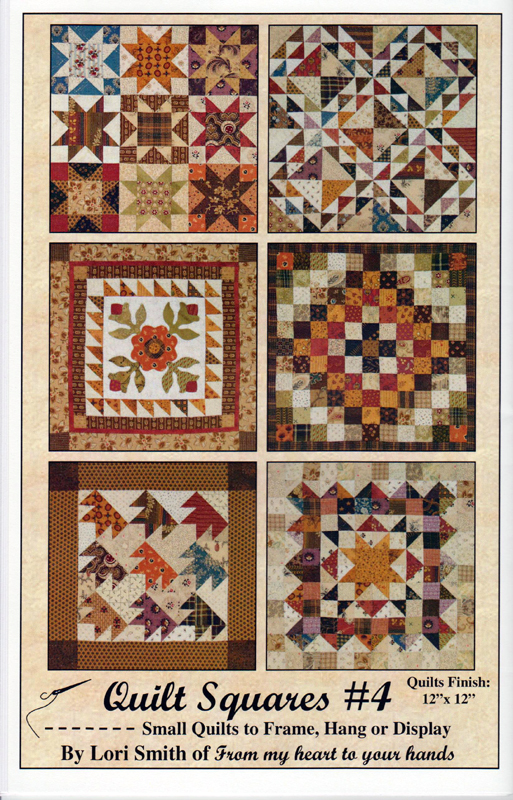 Knickels is a Path Speth pattern called Dawn to Dusk in her book More Nickel Quilts. 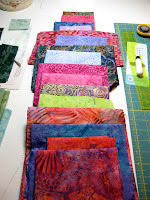 Check out how others are using their stash at Patchwork Times. Here is the layout I have decided on for Kamile. I've got the in between rows assembled. Time to put the "G" piece between each of the blocks. So close.....can you tell I'm excited to get this one finished? Tomorrow is an off Friday for me...I get to sleep in...aah! 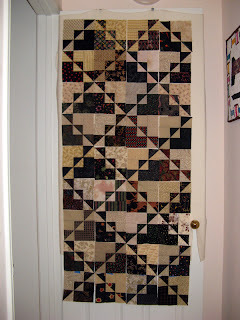 Then it's up, exercise, and off to Kerry's for a fun day of sewing. I'll be taking Knickels with me to work on. Kerry has told me that Kordova Klosure is ready for me! Most excellent! This Memorial Day weekend is off to a great start! 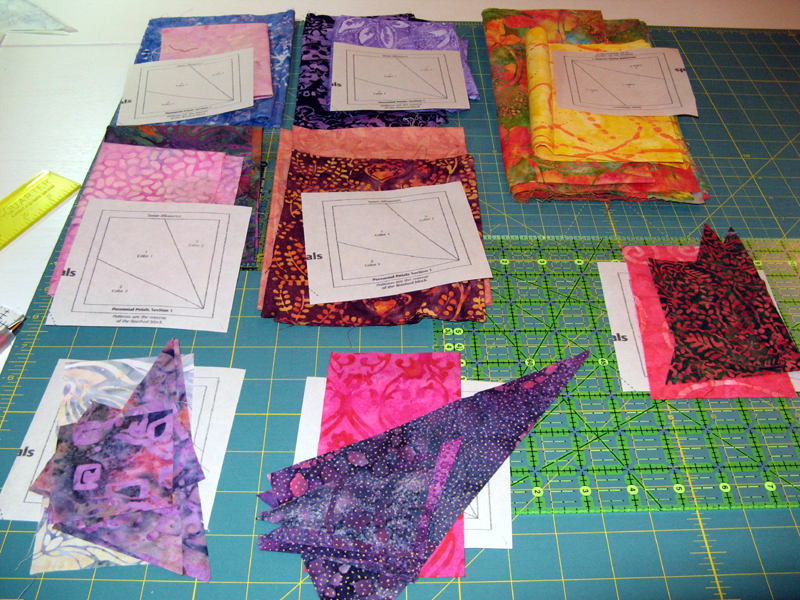 Here's how I started Tuesday sewing night. Dancing With The Stars Finals had the outcome I'd hoped for after Derek and Maria were eliminated. Donald really improved over the last weeks...just loved his Country Dancing...not that I'm necessarily a Country Western kinda girl! I had no idea the show was to last until 11pm PST. Way past my bedtime, but it did provide enough time for a Final with Kamile. Perhaps a Semi-Final is more appropriate since I've still got the assembly of the sashing and setting triangles yet to go! Placement of blocks still needs to be figured out. I can see from the current layout that the light purple flower that is fourth down on the left side needs to be moved in, but also keep it away from that bright blue one. Pinks and purples may need to be distributed a little bit better too. I think I brought in enough yellows and oranges with the last 11 flowers. The sashing will add 2" around each block making Kamile "blossom" further. Hope you are having a good week. Memorial Day Weekend is nearly upon us; it will be the first paid holiday for me this year...there's a long drought between Christmas/New Years and Memorial Day! 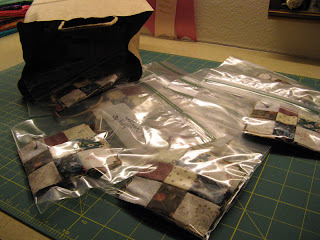 Here's how I started my Monday sewing evening while watching Dancing With The Stars Finals. Here's how I finished the evening. 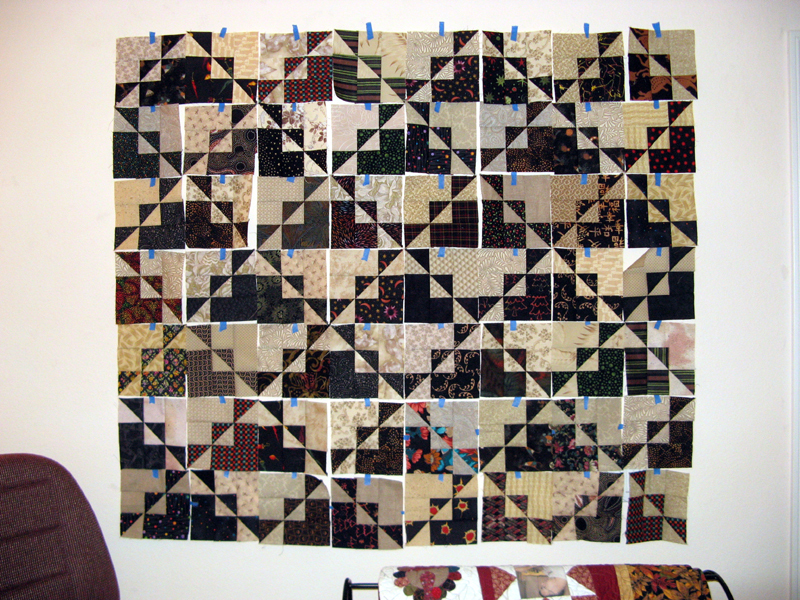 The last 11 are pieced into their three sections. Tonight Dancing With The Stars Results will continue and so will Kamile. Thread already changed to green for doing the stems. 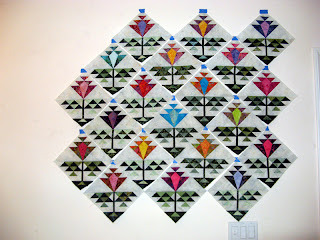 Next photo you see should include the last 11 flower blocks. Here's how I started off the week, busy with Kamile. These are the last 11 blocks to put together. All the HSTs are sewn and pressed ready for trimming up with my Bloc-Loc ruler. All trimmed up and ready to assemble. 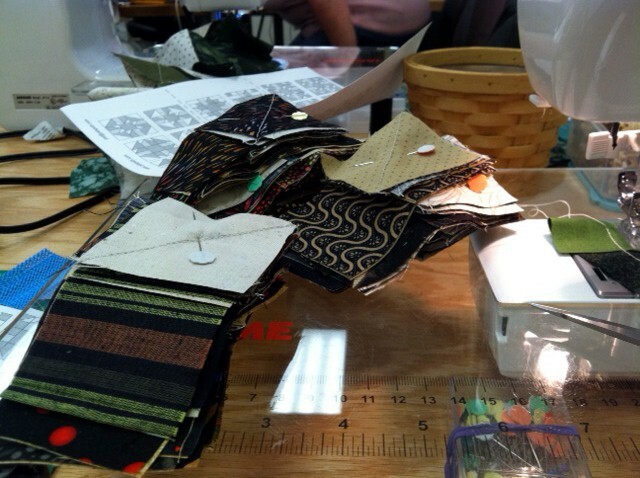 There are three parts to piece; then its sewing the stem in place and finally putting all three pieces together. These are some labor intensive blocks! I've got the first of the 11 into three parts; 10 more to go! 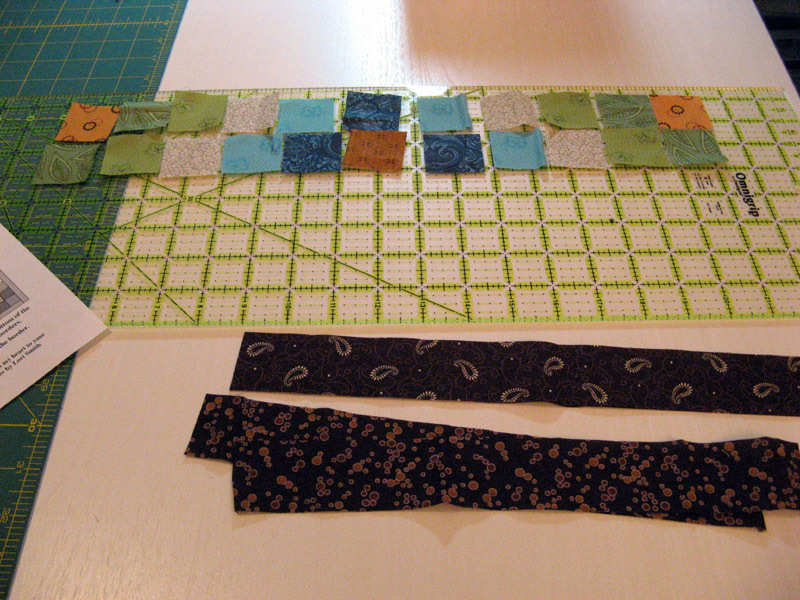 This is the middle and bottom pieces ready to assemble. 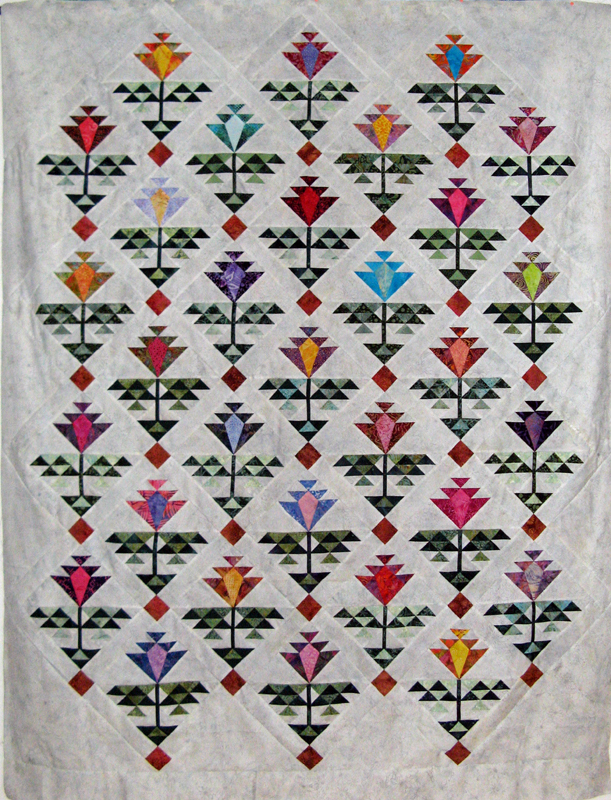 The flower pieces is on the pattern just to the left. This one is green and red with a red center. These are the fabrics used in all 31 fabrics. I didn't repeat anything! Back in my stash they go for the next project. These are the fabrics I'll be using for the setting. 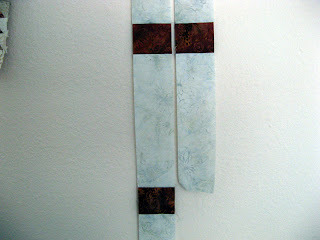 More of the same background and the rust color adds a bit of interest. The sashing will look like this. I'm getting closer all the time. I'd say all is looking good for finishing Kamile on time by the last day of May! Here's Katnip Krazy...well a little peek! 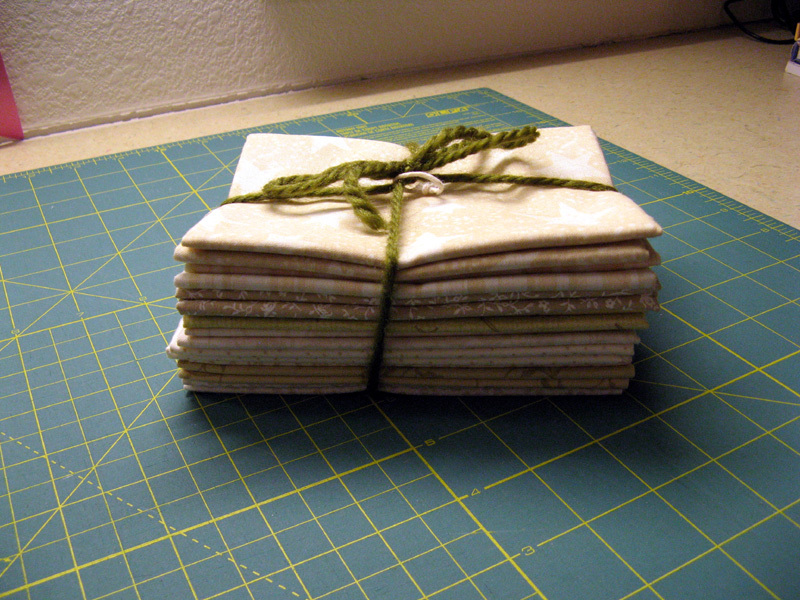 Binding, sleeve, and label are all that are needed to finish this one up. Kerry did a great job on this one. Come back again to see it! Look for more wonderful projects going on via Patchwork Times. Finished the week, yep Saturday...with a purchase of 1 1/2 yards of these luscious batiks. I felt Kamile needed some yellow...off to Beverly's I went. 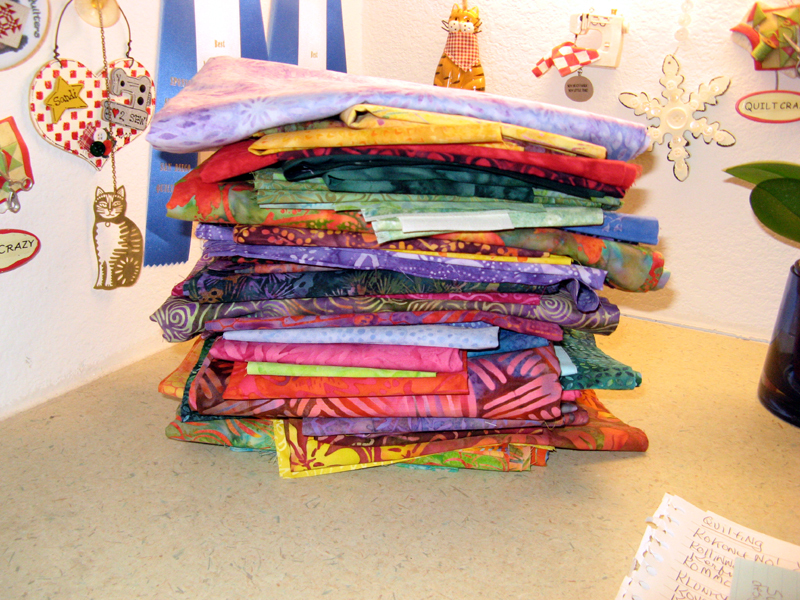 I sure was tempted to pick up a few more since to my delight all batiks were 25% OFF! These won't be added to my stash report because the wonderful cheddars are an unexpected gift from Kerry. We both find it difficult to pass up a cheddar. The strips are the swap from a purchase I claimed last week. Not a bad report; next week I hope to be reporting fabric used since Kamile should be done. Hope you had a great week. 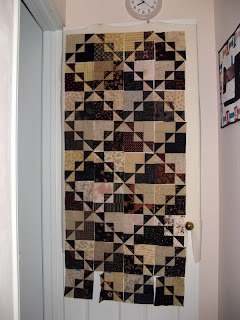 See how others used up their stash OR added to it at Patchwork Times. Kamile is coming along...slow, but consistent. I've got 20 done, eight more matched to fabrics and partially cut. Three more yet to be figured out. I'm thinking this project needs a little more yellow or bright orange. I've got one flower planned in these colors as you can see from the photo below. Nothing else in either mine or Kerry's stash to get...looks like an Amidon or Memory Lane run is in the making. I'll be cutting the setting triangles next to make sure those big pieces don't come back to bite me! The background fabric was purchased early last year, from Cozy's I believe. I don't even want to think about the need to find more. This afternoon I will be picking up a quilt that Kerry finished quilting for me. It's my Katnip Krazy that is a Buggy Barn pattern called Crazy Cats. Come back soon to see it...I'm quite anxious to see how the tails on the mice in the border turned out. Oh, if you go to the Buggy Barn website you won't find the adorable mice borders. 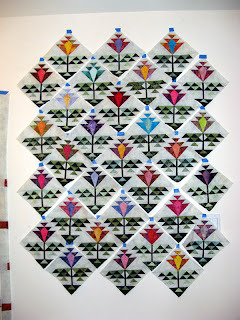 The border came from a class with Julanne Bergstrom (designed by her) that was at Amidon late last year. 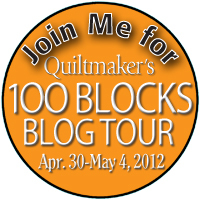 The first week of May Quiltmaker Magazine orchestrated a blog tour introducing their publication 100 Blocks Volume 5. 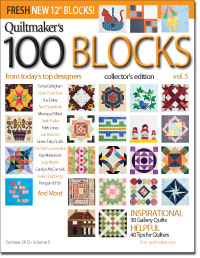 If you don't know about this terrific source of block designs I suggest you check them out. Volume 5 (with the Orange Banner on the cover) was released to newsstands on May 8. So back to the blog tour... As with volumes previously released, many of the designers of the blocks within this issue have their day during the blog tour to talk about their design and alternate ways you might use it in a project. Each designer offers a chance to win your very own Volume 5 just for checking them out during the blog tour. Many of these generous designers offer even more opportunities to win additional prizes. There were about 12 designers to visit each of the five days. On Friday, the last day of the blog tour I submitted my chance to win with Janelle Noack of Country Matters. Janelle has a nice design in Volume 5 called Desert Dash. There were 182 who hoped to be lucky, but I came out on top to win any pattern of my choice from Country Matters. 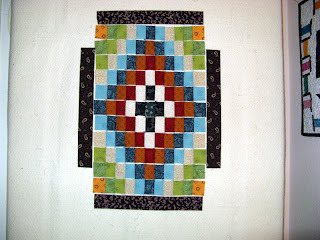 I chose Hopscotch which is a Block of the Month series of ten patterns. I received my prize yesterday all the way from Australia. I'm looking forward to making this project...it begs to use my stash! Thanks again Janelle. I'll be sure to send you photos when my Hopscotch is finished. I've been able to get a bunch of the blocks almost together. I've got the three sections it takes to make one together for all but eight blocks. Next comes green thread to put the stems together and stitch them down to the middle. Final step is to put the three sections together. These should get done early this week. 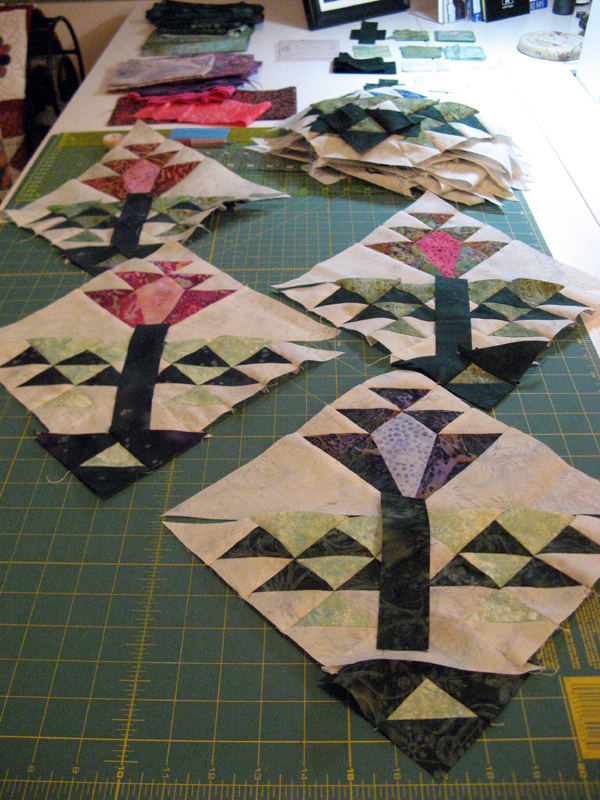 I've got three more flower blocks ready to cut and then I'll be back to stash hunting for the remaining five flowers. Think I'll try to find something orange or yellow for the flower and perhaps a darker color for the center of the flower. The leaves are already decided with many of the units already cut. These are the only three that are finished. 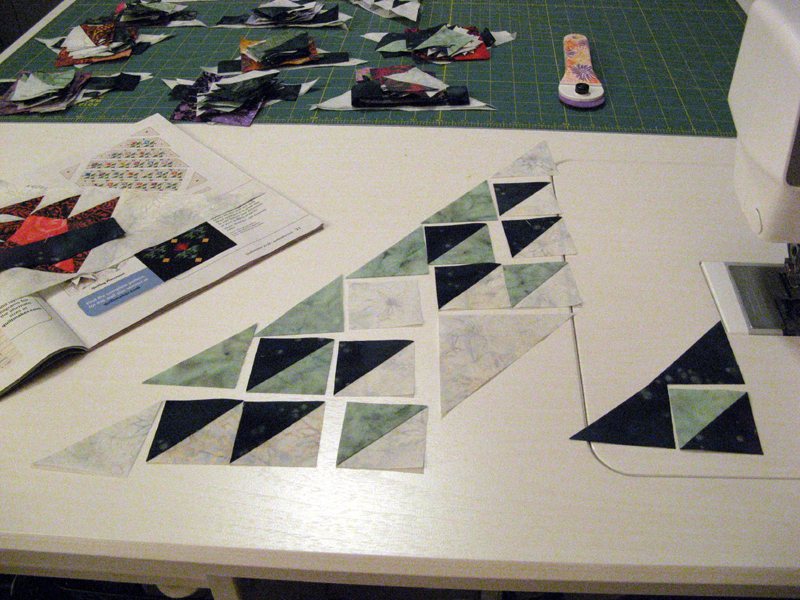 Before I cut any more into the background I need to cut the setting triangles and the corners. Those big pieces can get you if you don't take care of them soon on into the cutting. Kamile is going to be one fine quilt! Knickels remains unchanged since the workshop on Wednesday. Kamile needs attention now in order to have it done before May is done. 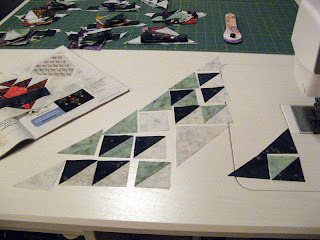 Here's where I stand with the Quilt Square Quilt Along Blocks. 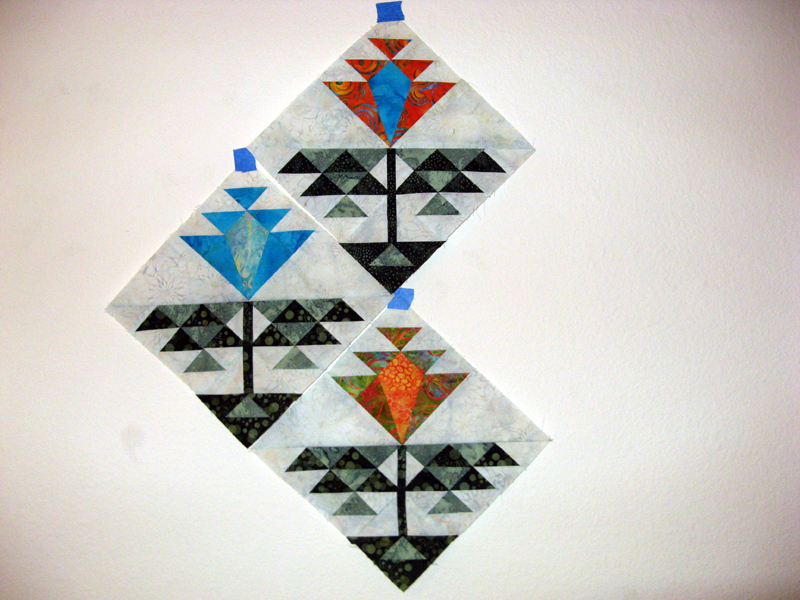 The fifth block is determined and will be assembled after Kamile. It too must finish before May is done. 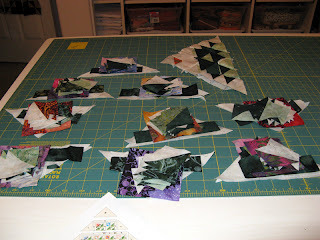 I've got my sewing project set for May...what do you have fun going on in your sewing room? See other projects on Patchwork Times. Have a wonderful week ahead. Happy Mother's Day to all you Moms. 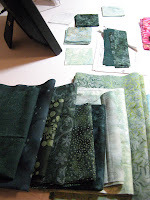 Hope you're allowed to sew from dawn to dusk today if that's what you want to do! It's your day...you make the calls! To my Mom, I love you! Can't wait until just a few short weeks from today that I'll be making breakfast for you. Hugs aren't too far from today. I hope your day is filled with happiness. Thought I'd share a couple of pictures of my newest project Knickels. 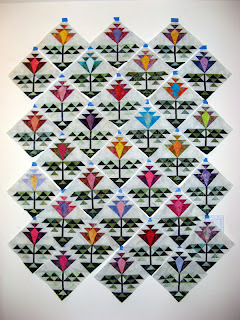 Sunshine Quilt Guild brought Pat Speth in from the windy cities this month. I'd taken a workshop with her several years ago and knew I wouldn't miss her lecture and the workshop that was yesterday. 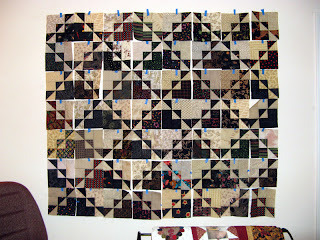 Pat's niche is using 5" squares or what she's coined as Nickels. I've heard her referred to as "The Nickel Lady"! 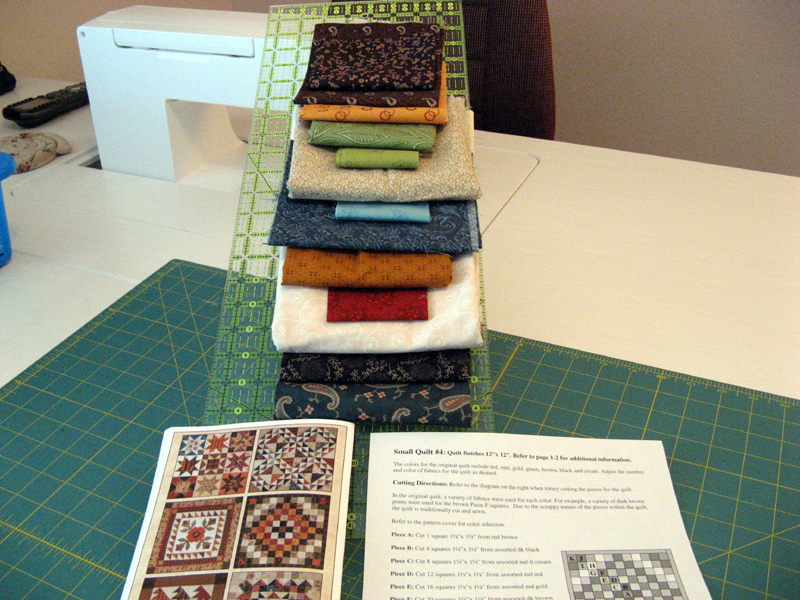 She has four books all available right now with patterns and border options almost too many to count. Her most recent book is all about borders. My project is her design Dawn to Dusk from her second book. I'm stash busting again using only from kwiltnkats quilt shop! I decided to use up some blacks and tans for Knickels. At the workshop which was held at Memory Lane in El Cajon I was able to get done with 20 blocks before packing it up for home. After getting home I had another 16 all ready for sewing...so guess what I did? I'll be making a total of 80 blocks (can you find a single block?). I'm finished with 36 right now. It won't be long until I'm back at this project, but the two May UFOs need my attention if I'm to get them done on schedule. By the way if you are in or going to visit San Diego this weekend Memory Lane is having "The Nickel Lady" do two workshops this weekend at their shop in El Cajon. The workshops are both different and are on Saturday and Sunday. Not sure about openings for Saturday, but Sunday has some if you want something to do...perhaps with your Mom for Mother's Day. 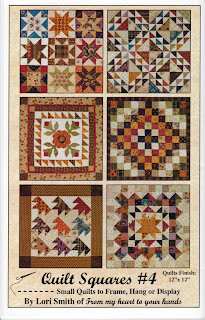 Jennifer is first to turn in her Crabapple Swap 9-Patches! Way to go...they're not even due until the end of June...my goodness I better get busy. It's Monday once again. This time the first one in May. Hard to believe that we are already into the fifth month of 2012...where does the time go? 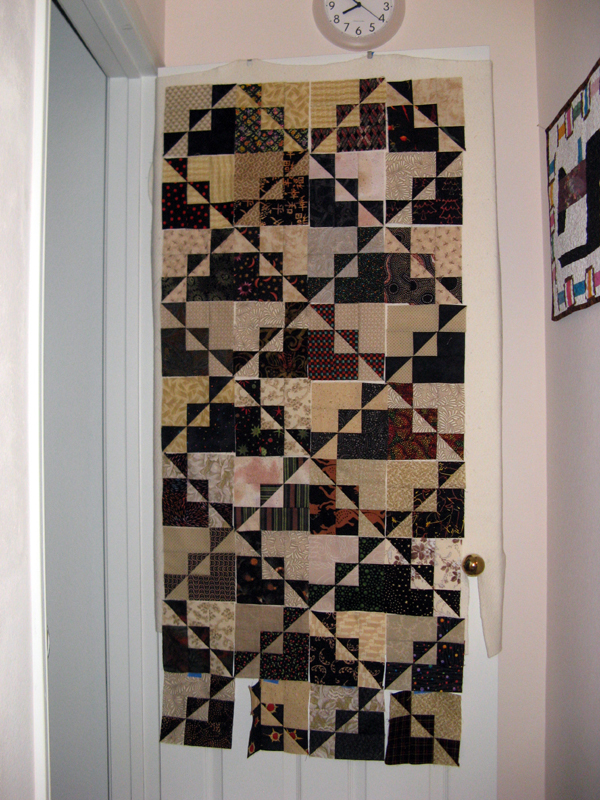 Wish it could be in my sewing room more often...how about you? Today starts off with Kamile on my design wall and all over my sewing table in various states. You can see that I've got three done. Another eight are cut into the pieces that will make the block with the paper pieced unit done. 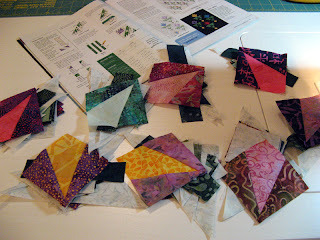 For these the next step is making the HSTs. 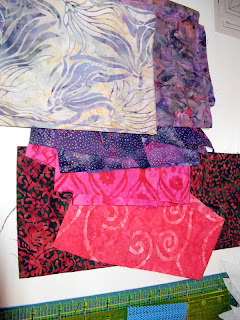 The fabrics below are for more flowers. 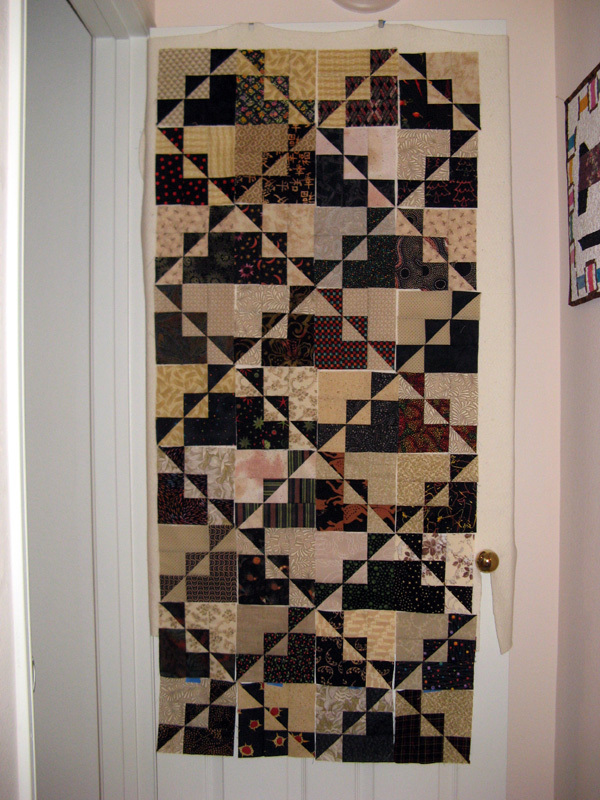 I've got the blooms matched up and I'll vary the dark/light fabrics with them. 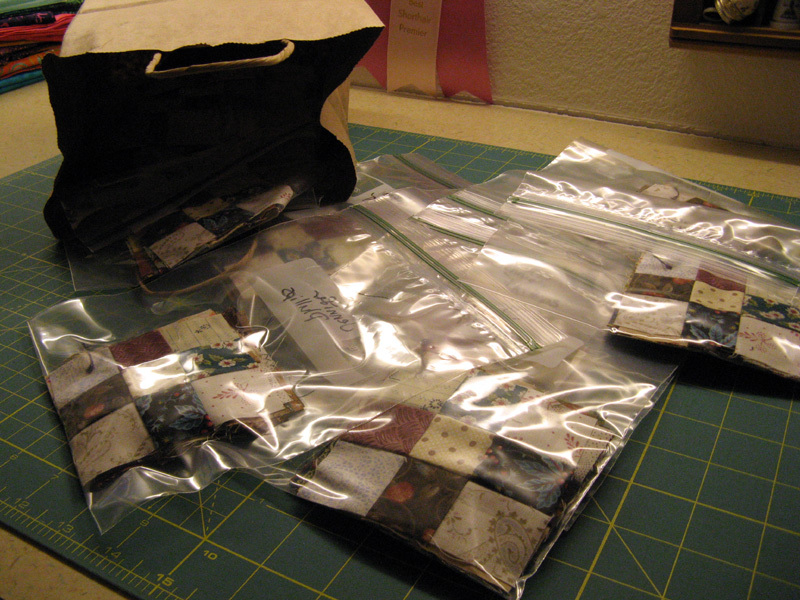 I still have 20 more to cut and sew to get to the 31 that are needed for the project. 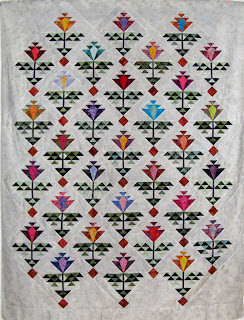 This is a Quiltmaker pattern from the March/April 2011 issue called Perennial Petals. The rest of the week will be a busy one for me. 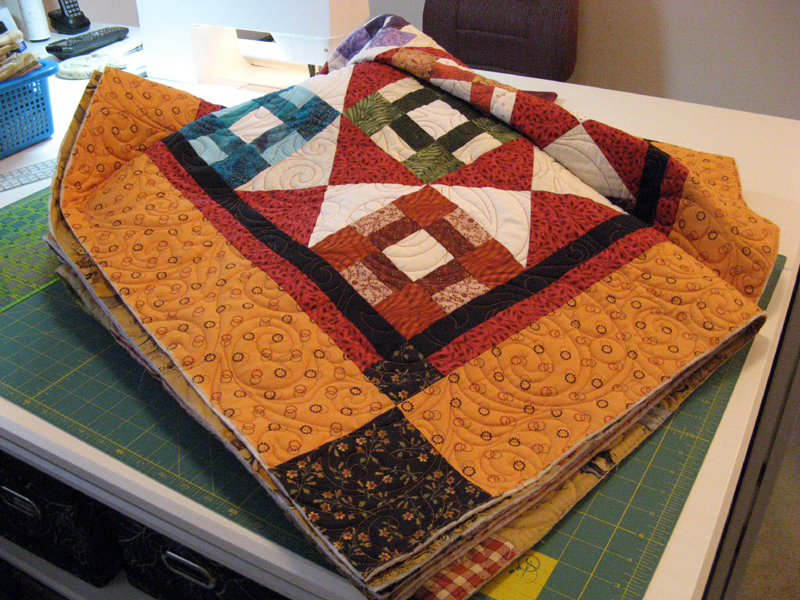 Tuesday night its Sunshine Quilt Guild Monthly Meeting. Our Guest Speaker is Pat Speth. 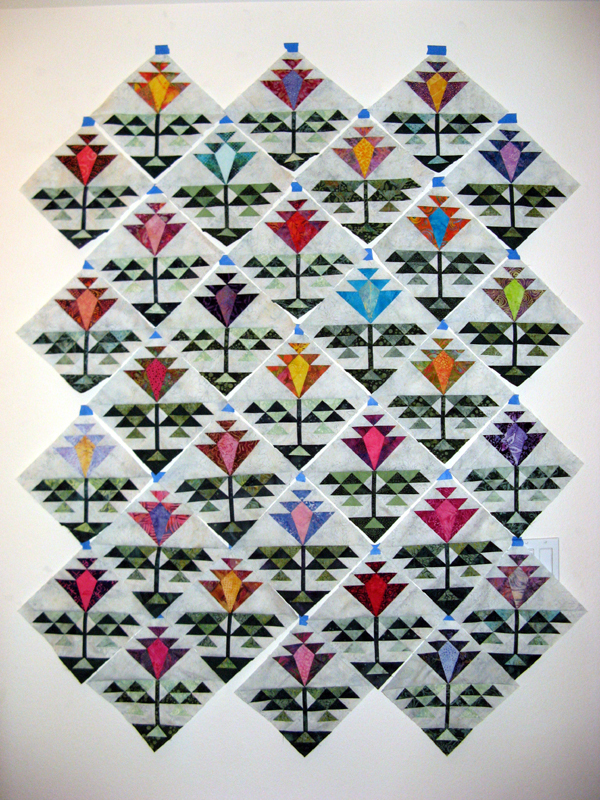 Pat is known for her use of 5" squares; the "Nickel Lady". 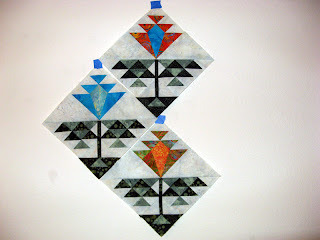 Wednesday I will be taking a day long class with her making her design Dawn to Dusk. 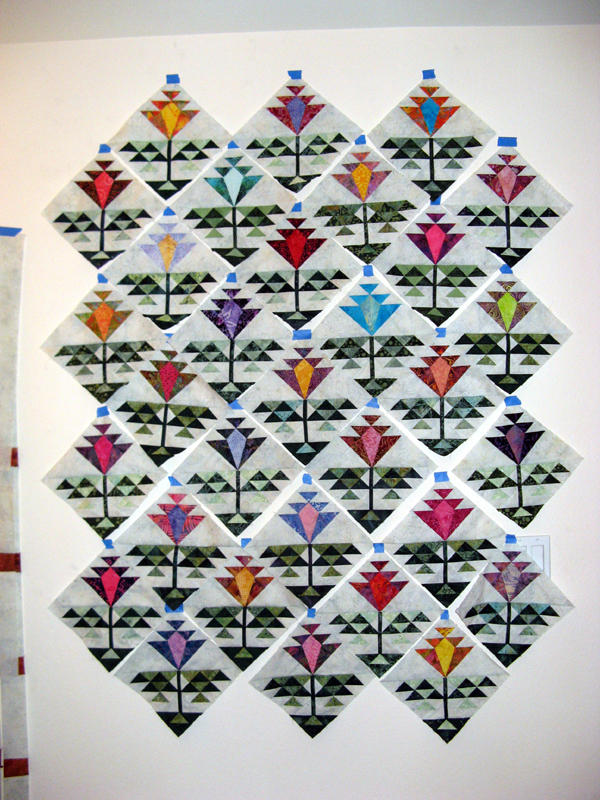 The pattern can be found in her book More Nickel Quilts. I will be making mine various blacks with a beige background. All from my stash hopefully.